South Africa's justice minister has blocked the early release of athlete Oscar Pistorius from prison on Friday. He said the decision by the parole board to free the athlete after serving 10 months of his five-year sentence was premature and without legal basis. It could now take months for the board to review its decision, legal sources told the BBC. Pistorius was convicted of manslaughter last year after shooting dead his girlfriend Reeva Steenkamp. The Olympic athlete insists he mistook her for an intruder. He was due to be transferred from prison to house arrest on Friday, when he was expected to stay at his uncle's three-storey mansion in the capital, Pretoria. Under South African law, Pistorius is eligible for release under "correctional supervision", having served a sixth of his sentence. One of his relatives, who did not want to be named, told Reuters news agency they were "shocked and disappointed" at the news. In a statement, South Africa's Justice Minister Michael Masutha said the decision to free the athlete was taken prematurely. "One sixth of a five year sentence is 10 months and at the time the decision was made Mr Pistorius had served only over six months of his sentence," the statement said. Thursday would have been Ms Steenkamp's 32nd birthday. Her parents held a small ceremony for her close friends and supporters in her hometown of Port Elizabeth, throwing roses into the sea in her memory. The decision by Mr Masutha to put Oscar Pistorius' early release on hold has come as a complete shock, not just to the Pistorius family but to many people who follow legal issues here. According to the prison department, the double amputee was going to be released on Friday because this is South African law - all offenders convicted under the same law as Pistorius can be considered for correctional supervision once they have served at least one-sixth of their sentence. In other words it was not the prison's independent view to release the Paralympian but part of South African legal procedure. Many believe that this will merely cause a slight delay to his early release. But the intervention by Mr Masutha, who is a lawyer, could have implications for many other cases which are less prominent. The decision was taken after a petition to the minister by the Progressive Women's Movement of South Africa, which includes the African National Congress Women's League, part of the governing party. It had described the athlete's early release as "outrageous" and "an insult" to victims of abuse. It seems as though his last-minute intervention was the result of this political pressure. This week, prosecutors filed court papers calling for the athlete's conviction to be converted to murder, which carries a minimum sentence of 15 years. His defence team has a month to file its response. 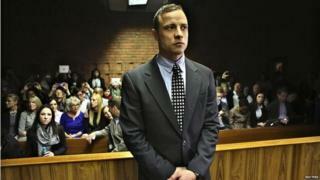 During sentencing, Judge Thokozile Masipa said the state had failed to prove Pistorius' intent to kill when he fired. Media captionTania Koen, a lawyer for Ms Steenkamp's parents Barry and June: "Ten months is not enough"
He went on to become one of South Africa's best-known sports stars, and was the first amputee sprinter to compete against able-bodied athletes, at the 2012 London Olympics.